Many rocks and stones were praised much back in the ancient era in various countries; and from these stones and rocks, lapis lazuli is one of the most revered rocks. Why lapis lazuli is famous despite the fact that it is actually a type of rock? It is from the fact that lapis lazuli has very intense and bright blue color, which distinguishes it from any other types of rocks. To understand about what is lapis lazuli stone and why it is very revered and loved in spite of its luster that is considered ‘dull’ unlike other gemstones, you must understand about its facts and meanings. Lapis lazuli is actually considered a semi precious rock, not mineral. Therefore, it looks rough without cleavage. In addition, it also looks massive just like any other rocks. However, the most distinctive feature from this rock is its intense blue color, even before the rock is polished and treated. Therefore, it is no wonder that this stone was often incorporated in the building and making of various historical buildings, royal artifact and many more. Lapis lazuli is mostly imported from Afghanistan from as old as 7th century BC, and until now, it is still the largest source of lapis lazuli that is later exported to other countries, including in Europe and America. 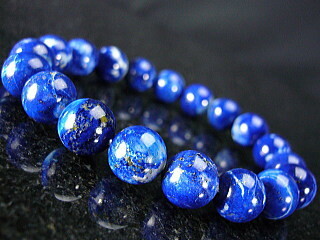 However, now lapis lazuli is also produced in Chile and Russia. USA and Italy also have lapis lazuli mines in small numbers. Nevertheless, when it comes to the largest lapis lazuli source in the world, it will always be Afghanistan. During Renaissance Era, this stone is famous among painters because it was used as a material for blue pigment called ultramarine pigment, which was famous at that time because of the brilliant blue color produced. WHY IS LAPIS LAZULI FAMOUS? Trying to understand about lapis lazuli stone will not bring you anywhere if you are not aware about its numerous qualities and meanings. Looking at the brilliant blue color tells you that lapis lazuli is more than a rock. The brilliant blue is considered special and thus it is used in various historical artifacts such as charms, amulets, Egyptian scarabs, jewelry boxes, beads, accessories and even kohl powder used by the famous Cleopatra. Moreover, the brilliant blue color of lapis lazuli is regarded as the symbol of knowledge and sacred wisdom, thus making lapis lazuli popular as amulets and charms for kings, healers, royalties, councilors and basically anyone who must take important decisions often. Now, lapis lazuli is often carried as a charm for people who, like kings and healers in the past, rely on knowledge and wisdom to make big decisions. This is also a good charm for students or people who want to be more in touch with their infinite wisdom and inner self. This is also a good stone to carry during meditation. Overall, if you want to know about lapis lazuli stone, carry one in your pocket or turn it into amulet, and experience the new feeling and positive qualities brought by the energy of the stone.